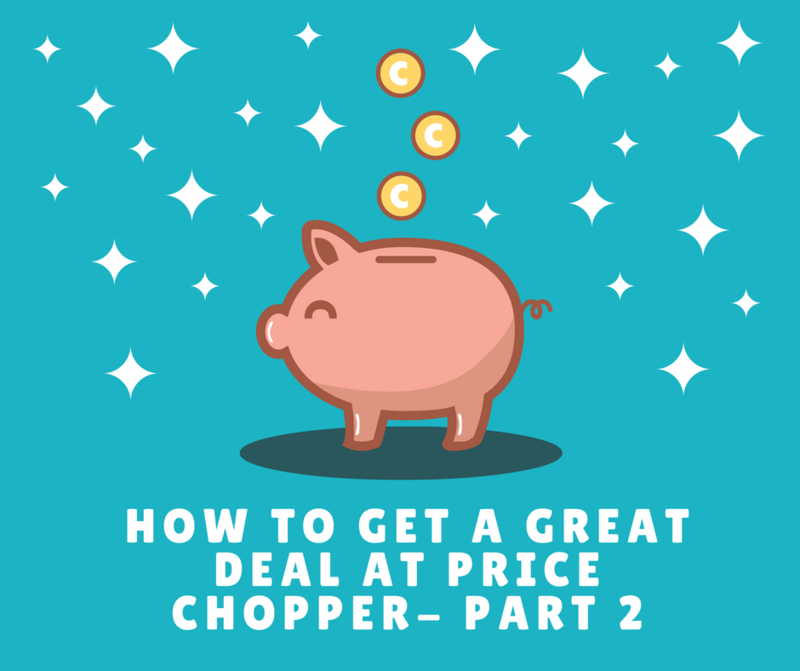 When I posted part 1 of how to get great deals at Price Chopper, I received a lot of feedback from readers who tried my tips and saved lots of money. Now I’d like to show you how to save even more money at Price Chopper! They double manufacturer coupons up to .99 cents– You can often get free items because of this. Find manufacturer coupons online (coupons.com is my favorite source- over 200 coupons! ), in the Sunday newspaper, on products websites/Facebook pages…or email companies and ask for them! You may “stack” coupons– You may use one manufacturer coupon PLUS one store coupon for the same item. Find store coupons in Price Chopper mailings, booklets you may find in store or at the iSave machine at the front of each Price Chopper (read the top of each coupon to see if it says “store coupon.”). Oils and vinegars…recently found the $6 champagne vinegar I needed for a recipe for half price! These clearance bins may be a corner shelf, a shopping cart or a table….look around! You may be surprised what you find there and every week is different. 3) Discounted Fresh Produce/Dairy– Look for their orange or blue markdown coupons stuck on packages expiring soon. I don’t suggest buying 10 yogurts that are expiring tomorrow just because the price is so good (unless you plan to freeze them) but you can find great mark downs on products that still have a decent shelf life. Look for yogurt, cheese, orange juice, milk, salad and even bags of single bananas that have been marked down. (These are store coupons so they can be “stacked” with manufacturer coupons for the same product, if you have one.) PLUS, if you find a product that is expiring within the week, ask a grocery manager to mark it down for you. On my above receipt, I had lucked out shopping a morning when the dairy employee had just marked down TONS of yogurt- I picked up lots for free by stacking coupons! Have you noticed how competitive Price Chopper has been lately with Hannaford and ShopRite? Use this to your advantage! Remember, Price Chopper is currently the only store in our area that accepts competitor’s coupons so if you find a coupon for another grocery store, bring it with you to Price Chopper and they will happily take it. As I find them around town, I will let you know! Speaking of….did you catch the Hannaford $4 off meat coupon in this week’s Bethlehem Spotlight??? Find up a copy (dated 8/29) today in the Bethlehem area. This entry was posted in Capital Region Deals, Price Chopper. Bookmark the permalink.